What to do: Attach the Cangun to the Aerosol Can to get better control than using the spray button alone. Spray your wheels with Plasti Dip to get a smooth matte finish. 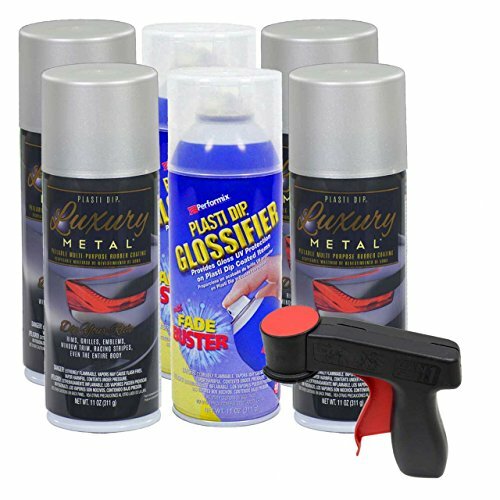 Spray Glossifier over the Luxury color to get a shiny gloss finish. Plasti Dip is a synthetic rubber based coating that's perfect for a wide range of projects and applications. Plasti Dip can be used as a coating for automotive detailing; coating wheels; and painting graphics that can be peeled off without affecting the car's OEM finish*. Plasti Dip Aerosol Spray is an easy to apply matte rubber finish in an aerosol can. What Plasti Dip Can Do Resists moisture, acids, and alkalines Protects against electrical shock Anti-Skid, Anti Slip, Abrasion resistant Remains flexible and stretchy Will not become brittle or crack even in extreme weather *Always test first. AWarehouseFull is not responsible for adverse reactions. If you have any questions about this product by Plasti Dip, contact us by completing and submitting the form below. If you are looking for a specif part number, please include it with your message.